Must love junk Collectors Colonial style Home tour! thrilled and honored to be a part of Debbie’s Home Tours! using it to add whimsy and personality to my space! Welcome to my home, and enjoy! Junk never looked so good Susan! If you don’t know Susan she would love for you to pop over to her home and say hello! I see lots of treasures I could sneak home. I want that butcher block for my kitchen. Thanks for sharing. Love all of Susan’s vintage junk. She has the perfect home to display it. Thanks, Debbie. What a wonderfully unique home! Thank you for sharing. Oh my goodness! Debbie… You know I am in love with this house! It is simply beautiful! Thanks for sharing Must Love Junk with us! Susan has a home that I could spend hours in just taking in all of the details that make up her fabulous style!! Wow I love this home!!! So many treasures that I would love to have!! Thanks for sharing!!! I am a big fan of Susan and her blog. She and I started our blogs about the same time. I love her style and the inspiration which helped me to get started. She is as sweet as they come and so genuine. 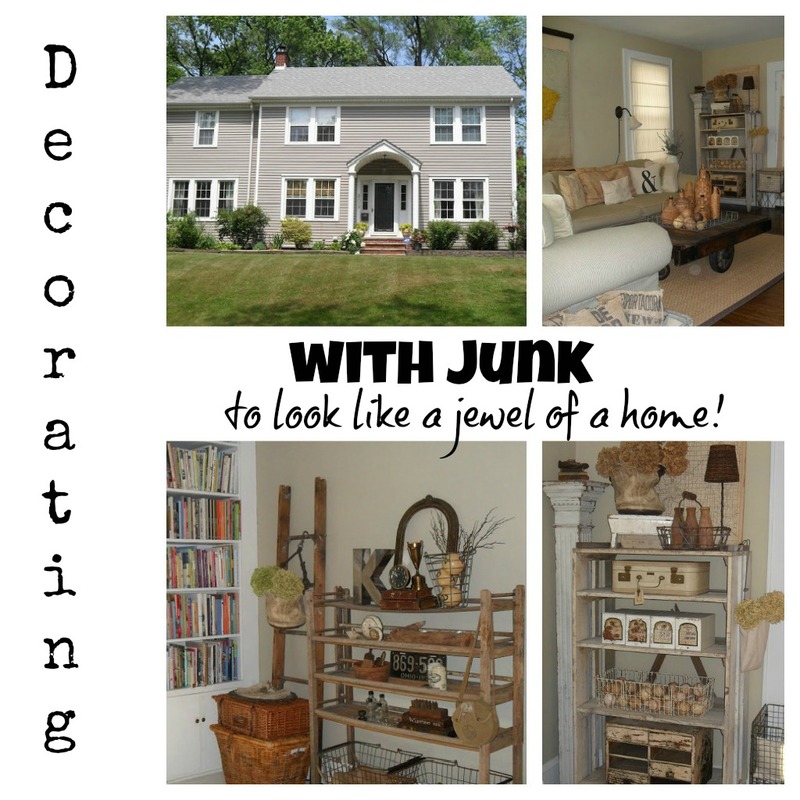 Must love Junk is a perfect name for her blog because she know how to find it and love it into her home. Love Love all rooms in her home. Thanks for sharing her blog and home with us. Susan’s home is awesome, so many things I’d love to find! I love her curtains too! HI Susan! From another Ohio blogger! : ) You’ve got some great pieces in your home. I love your entryway. Your dining room looks like a comfortable place to sit and chat over dinner with friends. What a fabulous home! I am just swooning over her incredible collections, but it’s Susan’s great styling skills that put it over the top. There’s so much inspiration here, I’ll be back again and again to see this home! Susan’s home is so very charming!! Susan! I want to shop your home. Love your “junky” style. I’d take it any day of the week. Everything is so charming and unique!! Susan has some fantastic collections and she displays it all so well. I would wander her place just taking it all in. I just love Susan’s unique style, so creative and original. She really has made her house a wonderful home. I just started following her blog and love it! Thanks for the feature, Debbie! I love looking at pics of Susan’s home. She has such a unique style and lots of wonderful eye candy to look at! I love all of her industrial touches throughout. I love the canvas mail cart filled with burlap pillows by her sofa. Such a great look! Would love to have that manequin too in my bedroom by my floor mirror! Great accessories, that butcher block is fantastic! Debbie and Susan, Great tour…I was overjoyed to see the beautiful arched ceiling above the front porch. What a welcome that is to all your guests! Love the coat rack, gorgeous staircase and the iron piece across from the stairs. Just to name a few…great home and it show a lot of love there. Thanks so much for the tour and the introduction to Susan’s blog. I am so amazed with not only her collections but how she displays them. LOVE Susan’s home and blog. Thanks for featuring her adorable colonial, Debbie! What a fun tour! I think I could spend a few days there just looking at all the interesting finds. Of course, I need to hear the fun stories, too. Enjoy your weekend and thanks for the beautiful tour! Wow, so many collections of vintage goodies. Enjoyed the tour…thanks for sharing. Susan has a beautiful home! So many collections, yet so restrained at the same time! Susan your home is beautiful inside and out! Wonderful sense of style and decorating! Hi Debbie, I love Susan’s home! She has such a knack. It is so warm and cozy and I love all of her fabulous junk! 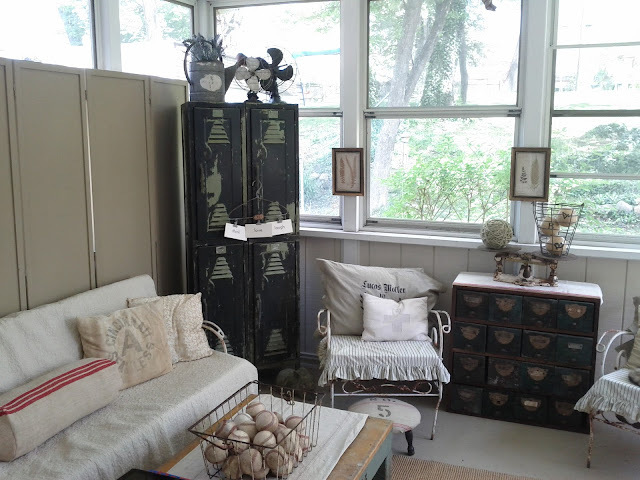 Debbie…I so love Susan’s home and her blog….Susan is so talented and I just love the way she decorates her home with all those magnificent antiques!…Thanks for presenting her home…and Susan..you know how much I love it!! Such a cool home with loads of interest with unusual and great junk pieces. Who wouldn’t love this. She has the talent of eye and display. Oh my goodness…I want to live there!! !